The term "Wi-Fi" suggests "Wireless Fidelity", has often been used in an informal way, even by the Wi-Fi Alliance itself, but officially the term does not mean anything. The term "Wi-Fi", first used commercially in August 1999, was coined by a brand consulting firm called Inter brand Corporation that had been hired by the Alliance to determine a name that was "a little catchier than 'IEEE 802.11b Direct Sequence".Inter brand invented "Wi-Fi" as simply a play-on-words with "Hi-Fi", as well as creating the yin yang style Wi-Fi logo. The Wi-Fi Alliance initially complicated matters by stating that it actually stood for "Wireless Fidelity", as with the advertising slogan "The Standard for Wireless Fidelity",but later removed the phrase from their marketing. The Wi-Fi Alliance's early White Papers still held in their knowledge base: "… a promising market for wireless fidelity (Wi-Fi) network equipment. "and "A Short History of WLANs." The yin yang logo indicates that a product had been certified for interoperability. The Alliance has since downplayed the connection to "Hi-Fi". Their official position is that it is merely a brand name that stands for nothing in particular, and they now discourage the use of the term "Wireless Fidelity". WiMAX is the next-generation of wireless technology designed to enable pervasive, high-speed mobile Internet access to the widest array of devices including notebook PCs, handsets, smart phones, and consumer electronics such as gaming devices, cameras, camcorders, music players, and more. As the fourth generation (4G) of wireless technology, WiMAX delivers low-cost, open networks and is the first all IP mobile Internet solution enabling efficient and scalable networks for data, video, and voice. As a major driver in the support and development of WiMAX, Intel has designed embedded WiMAX solutions for a variety of mobile devices supporting the future of high-speed broadband on-the-go. 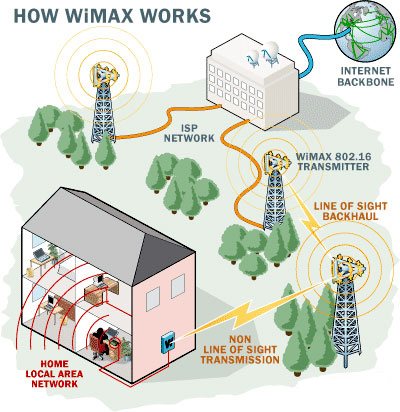 WiMAX (Worldwide Interoperability for Microwave Access), is a telecommunications technology that provides for the wireless transmission of data using a variety of transmission modes, from point-to-point links to portable internet access. The technology provides up to 75 Mb/s symmetric broadband speed without the need for cables. The technology is based on the IEEE 802.16 standard (also called Broadband Wireless Access). It should be essential to manage elements in a WiFi and WiMax networks as well as a wide variety of devices such as gateways (both dual band and tri band), and access points. WiMAX is a term coined to describe standard, interoperable implementations of IEEE 802.16 wireless networks, similar to the way the term Wi-Fi is used for interoperable implementations of the IEEE 802.11 Wireless LAN standard. However, WiMAX is very different from Wi-Fi in the way it works. In Wi-Fi the media access controller (MAC) uses contention access — all subscriber stations that wish to pass data through a wireless access point (AP) are competing for the AP's attention on a random interrupt basis. This can cause subscriber stations distant from the AP to be repeatedly interrupted by closer stations, greatly reducing their throughput. This makes services such as Voice over Internet Protocol (VoIP) or IPTV, which depend on an essentially-constant Quality of service (QoS) depending on data rate and interruptibility, difficult to maintain for more than a few simultaneous users. In contrast, the 802.16 MAC uses a scheduling algorithm for which the subscriber station needs to compete only once (for initial entry into the network). After that it is allocated an access slot by the base station. The time slot can enlarge and contract, but remains assigned to the subscriber station, which means that other subscribers cannot use it. In addition to being stable under overload and over-subscription (unlike 802.11), the 802.16 scheduling algorithm can also be more bandwidth efficient. The scheduling algorithm also allows the base station to control QoS parameters by balancing the time-slot assignments among the application needs of the subscriber stations. The original version of the standard on which WiMAX is based (IEEE 802.16) specified a physical layer operating in the 10 to 66 GHz range. 802.16a, updated in 2004 to 802.16-2004, added specifications for the 2 to 11 GHz range. 802.16-2004 was updated by 802.16e-2005 in 2005 and uses scalable orthogonal frequency-division multiple access (SOFDMA) as opposed to the orthogonal frequency-division multiplexing version with 256 sub-carriers (of which 200 are used) in 802.16d. More advanced versions, including 802.16e, also bring Multiple Antenna Support through MIMO. See: WiMAX MIMO. This brings potential benefits in terms of coverage, self installation, power consumption, frequency re-use and bandwidth efficiency. 802.16e also adds a capability for full mobility support. The WiMAX certification allows vendors with 802.16d products to sell their equipment as WiMAX certified, thus ensuring a level of interoperability with other certified products, as long as they fit the same profile. Most commercial interest is in the 802.16d and .16e standards, since the lower frequencies used in these variants suffer less from inherent signal attenuation and therefore give improved range and in-building penetration. Already today, a number of networks throughout the world are in commercial operation using certified WiMAX equipment compliant with the 802.16d standard. 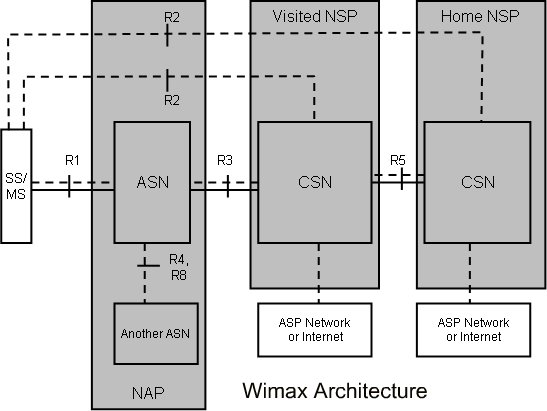 The WiMAX Forum has defined an architecture that defines how a WiMAX network connects with other networks, and a variety of other aspects of operating such a network, including address allocation, authentication, etc. An overview of the architecture is given in the illustration. Mobile WiMAX based upon 802.16e-2005 has been accepted as IP-OFDMA for inclusion as the sixth wireless link system under IMT-2000. This can hasten acceptance by regulatory authorities and operators for use in cellular spectrum. WiMAX II, 802.16m will be proposed for IMT-Advanced 4G. The goal for the long term evolution of both WiMAX and LTE is to achieve 100 Mbit/s mobile and 1 Gbit/s fixed-nomadic bandwidth as set by ITU for 4G NGMN (Next Generation Mobile Network) systems through the adaptive use of MIMO-AAS and smart, granular network topologies. 3GPP LTE and WiMAX-m are concentrating much effort on MIMO-AAS, mobile multi-hop relay networking and related developments needed to deliver 10X and higher Co-Channel reuse multiples. Since the evolution of core air-link technologies has approached the practical limits imposed by Shannon's Theorem, the evolution of wireless has embarked on pursuit of the 3X to 10X+ greater bandwidth and network efficiency by advances in the spatial and smart wireless broadband networking technologies.